EDIT: I changed the thread title because of Stan's blatant derail. Well that is an interesting but incomplete view of the process. Must do the heat treat and metal work in another building. 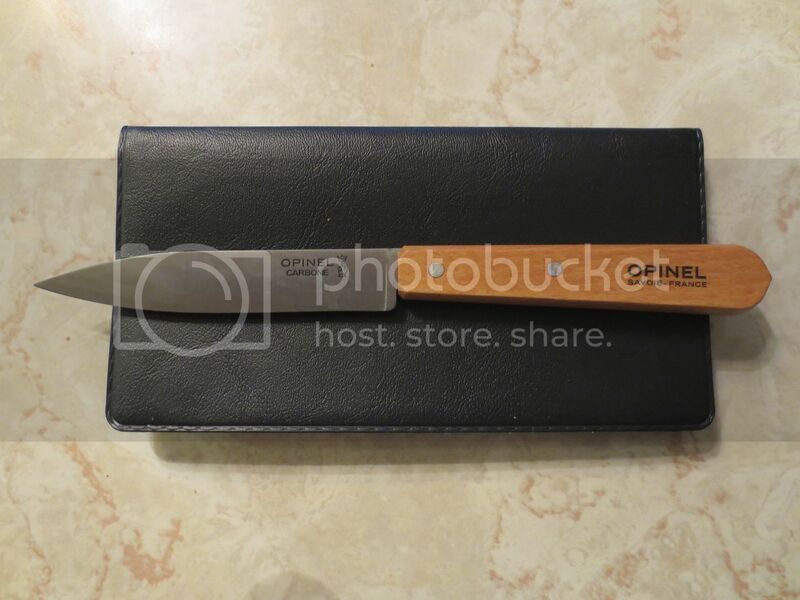 I have never seen any of their fixed blade products or, in fact, owned one of their folders. I know you like them Wolfy so they must be Wolfy approved. 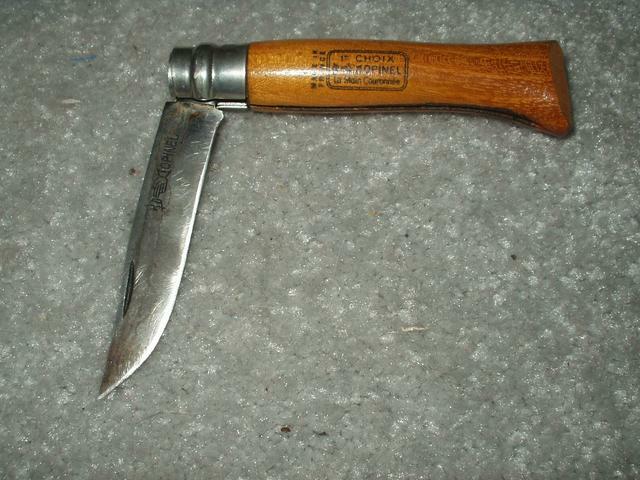 And, as an afterthought on Opinel, do you know much about the French makers who market knives under the name Laguiole? 'Their knives look somewhat like Opinel but are more costly and many have corkscrews. And, as an afterthought on Opinel, who is Laguiole? 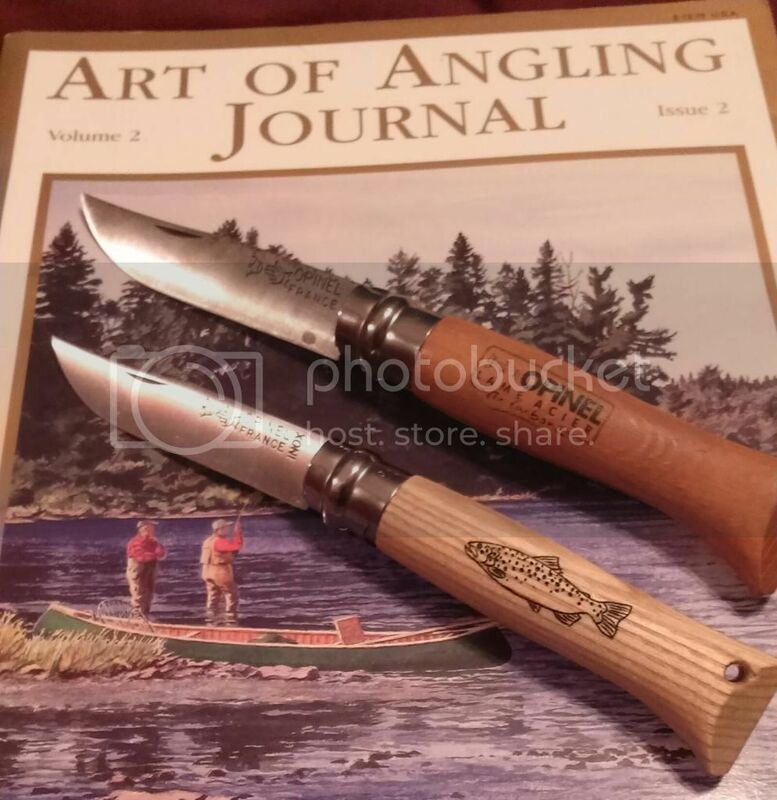 'Their knives look somewhat like Opinel. I'm not real sure, but they may be made in Spain. I say that because my wife brought back a couple of them for me when she took a trip there to visit her aunt in Malaga. They are similar to the Opinel, but the Laguioles I have are quite a bit 'higher-end' in overall appearance and the materials used in construction. NOPE, wrong again. .....it's a place located in southern France, famous for cheese, knives and corkscrews. One of the folders she bought for me has a corkscrew. I modified my question while you were posting. They are French and from a region of France so there are more than one maker using the name. They are much higher priced than the Opinel. At any rate when I was hunting birds in southeastern SD there were a few doctors on the hunts who had these knives. Useful for opening wine bottles mostly. Yeah, the corkscrew feature was pretty much a superfluous feature for me, too. As I recall, most of the wine I ever opened only required fishing around with my finger in the cardboard box opening for the spigot! That is a good link to Languiole knives Wolfy. It is too bad that the market has become global and resulted in many inferior copies being made. Did I hi-jack this thread by asking about Languiole knives? If so, I am sorry. Back to Opinel. I want one. I see that they come in a wide range of sizes from uselessly small to usefully big. If it were to be used around the farm for cutting bale string, skinning a mink, or other utilitarian tasks what size would you recommend? Remember that it should fit in the pocket of my bib overalls too. Though I would never do such a thing , I just went ahead and modified the thread title.....so that covers it for both of us! I'm partial to the #8.....carried pommel-end down in my plier pocket. That keeps the ring-lock end up and prevents premature wearing of a hole in the bottom of the plier pocket. It's easily picked out by the index & 'social' fingers in that position and there are no worries about cuts from a partially opened blade, either. The newer ones have a notch to lock them in the closed position, but mine is too old to have that feature. Gracias. A number 8 it shall be. Modifying them is easy & fun. The top one is in my pocket now. Here are a handful that I grabbed from our flock of carbon-bladed Opinels. The first one is an unused #14 that a friend had me get for him when he couldn't find the one he lost......then he found it. The second one is one of a pair of #8s that I carry.....one as a spare in my MAN bag , and this one that I've carried for years in the plier pocket of my bib-overalls. You may have heard me mention it before. The third one is Heather's favorite #7 (getting harder to find) that she uses for almost everything. The fourth one is a #2 that was given to me by one of my nieces for Christmas one year. She had to endure one of my rants on the attributes of the lowly Opinel when she was visiting us one summer.......and she apparently never forgot it. I bought one years ago and neglected it. It froze irrevocably. A friend gifted me one with a "Kracaneuner Tribe" decal affixed to it. The decal is long wore off and the knife still rides with me everywhere. It is a light utility knife. String, tape, I cut pipe foam for roof racks with it yesterday, but it's primary use is food prep. when I'm not in a kitchen (and sometimes when I am). Lightly patina'd, it's starting to get that "good ole knife" feel. It sharpens easily and quickly. It is a reminder of a friend. What more can you ask of a pocket knife. You could pick your nose with the Number 2. Beautiful. Well put, Max. As good a description as I've heard on the poetry of a good pocket knife. Thanks for the factory tour Wolfy, pretty cool. I've got a No. 8 in stainless that I really like. I've got a 9 and a 12- the 9 fits my hand pretty well, a bit small still....the 12 is quite large, but pretty hefty. The humidity here plays heck on them and sometimes they really want to be hard to open at first. They do take a wicked edge, although I've rolled the edge on my 9 before. The 12 is wide enough that the edge is a bit more robust. No. 8 is the most common and recommended, go with No. 6 if you like small but useable folders. I own a No.10 as well and made a belt sheath for it but it also makes a good haversack knife if you want more of a fixed blade length in a folding knife, or you have very large hands. No. 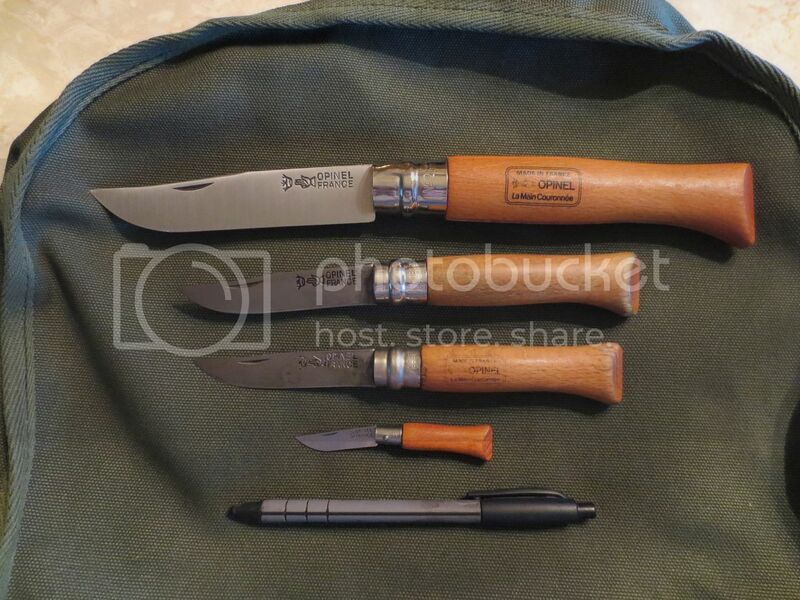 8 seems to be liked by most Opinel fans, it could be due to size or avalibility. Customized my Inox #8 this past week. Sanded the handle, shaping it for comfort and slimming it down a little. Restained it with a dark "coffee" stain, though the beech wood didn't really take it on like I expected. I'm pleased with it though. Out of the ordinary is good.....the stain looks like it 'took' evenly, too. Nice job! Have you sharpened it yet? Yup, wolfy, I've had this one a little while now, so, yes, it's been sharpened. I just wanted to get rid of some of the "whale tail" at the pommel and make it a little more comfortable. I tried to keep it close to the original in appearance. With the stain I was expecting it to come out a little darker. That's three coats on there, plus teak oil. had one years ago, and found it lacking. Never went back. Especially for backpackers who count ounces...it's something like 2 ounces for a full sized knife. Also, the closed Opinel makes a GREAT ferro rod striker...nice sharp spine works awesome. The closed Opinel also makes a pretty decent steel for a flint and steel. I like the #8, and I swap out the Opinel #8 with the Mora HighQ Robust...depending on what I think I will need or want. Sometimes, I carry both....it's an extra 2 ounces, after all. Maybe if they charged more for them. I think they have a use. I got one from a good guy I know. Its light, sharp, and easy to keep sharp. It works well in the garden, its a great paring knife, is light in your pocket and unobtrusive in public. It will gut a fish and sharpen a stick. It also cuts patches on a muzzleloader like all get out. This discussion could turn bloody , people can get offended pretty quickly when it comes to having their gear insulted, I know, I've been there and done that, when it comes to most gear I roll traditional, and I'm fussy about my sharps. Everyone that's been here for a while knows I'm no fan of ugly black Tactical/Survival knives for woods bumming, and you will seldom ever see me carrying a Mora knife of any kind, my reasons for this are picky and unreasonable, but they're mine. I've never owned a Laguiole knife, but I have liked the design for a long time, I do own an Opinel, I found it on a beach on Cape Cod too many years ago to remember, it was rusted shut, the wood was in sad shape, I was going to chuck it back in the ocean, but I didn't, I gave it some TLC and brought it back to life, the old #8 has repaid me for my kindness many times over, for someone who wants a lightweight lock blade folder that can be counted on and doesn't care what it costs, you could get a more expensive knife, but I doubt you'd get a better one than an Opinel for most of your needs. if they charged more, then they would no longer be 'damn fine knifes FOR THE MONEY'. ........and I am sure we all realize that one person failing to be on board, does not make his opinion an insult to another's gear or preferences. I never meant to suggest that, did you see my dig on Mora's ? If you liked that you should read my take on the BK series, we all have opinions based on our own personal experiences, what a boring world it would be if we all always agreed on everything. No insult taken my friend. I think my stainless #12 is the best kitchen knife I've ever had. Makes short work of the harder veggies (carrots, swedes, ect.). Wolfy, never had seen this, great video! My first Opinel, iirc is the No. 10 and it was a little on the small size. I got the No.8 later on and it was perfect in hand, and I do like the simplicity of the locking and retention. My Opinel #8 was brought back from France by my parents in the 1970's. I bought a Laguiole but am not sure if it was one made in France. Says AM Or J bacwards C M or N, it is two styilized for me to know for sure but it also has six sided "circle" on it with pattern inside it. Handle has sticker that says "Corne veritable" which means genuine horn. The left side of the handle also has 6 brass pins forming an upside down cross pattern with the centre pin being larger than the others. Can you post a picture of that knife, OC? I have never owned either knife........until tonite!i was gifted a barely(and i mean barely used)laguiole knife!!!!! Also have the paring knife - it's been my "at work" lunch knife for several years and doesn't take much to bring it back to shaving sharp. on the Laguiole, you can google the maker stamp on the blade to see where they are made. I've been wanting an Opinel for quite awhile now. the Dassaud is real Duece. Dassaud is fairly young French company that makes, among other things, that knife. Cool video.Never had a Laguiole,but have a couple of Opinels. It is a little long for me but it does take a nice edge. I picked up another Laguiole from the same flea market vendor as the last one, this smaller one has a cute white plastic handle. From the two I own and the ones shown here, I have to say that the biggest flaw in Laguiole knives is that the tang is the same width as the blade meaning that the blade contacts the metal spring; any other knife has a wider tang so you can snap the blade closed without dulling the blade. I found this video on a side by side comparison of the most popular sizes of the Opinel knives......I thought it might help those who are contemplating buying one on which size would suit them best. I like Opinel and have a couple of them. I wonder why they chose the German language to not speak in? They could have not spoken in French or even Serbo-Croation.